Thank you to the gorgeous, international group who joined us in our March 2018 sessions. It was such a joy, that we decided to hold this program again. Mark your calendars for February 4, 11,18, 15, 2019. Do you remember the moment when someone or something turned off your sense that you could draw? When that drawing switch flips off we lose the capacity to use drawing as our best thinking tool. Drawing and visual thinking enables us to navigate complexity and make meaning for ourselves and in groups. And these skills help us to think critically, reduce overwhelm and communicate clearly, and engage effectively in problem-solving, decision-making, and prioritizing. What keeps us from drawing is the inner criticism and judgement that our drawings aren’t beautiful and good enough. That’s the problem with seeing drawing as a noun or as an object. In this course, we embrace drawing as a verb and all that process-focused drawing can help us accomplish. Over these four weeks, we’ll shush the inner critic and give you concrete tools and experience to reclaim drawing as your best thinking tool. It’s easy to get stuck in list and text mode, but when was the last time you solved a problem in a straight line? Discover the new possibilities of paper and pen. Start building capacity and confidence in your ability to think visually. When you start using drawing as a thinking tool you are able to work more spatially and visually -- a major advantage when when you face complexity. We begin the course with a focus on your own personal meaning making -- helping you to flesh out and think more deeply about your own ideas. 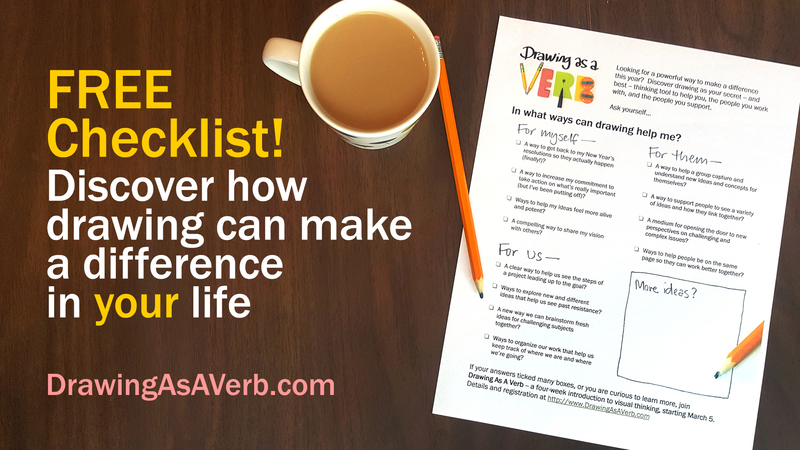 Brandy gives you four tips and a rule of thumb to build a foundation to your visual thinking skills. Next we add in listening -- the power of visually witnessing someone else. When you make ideas visual it changes the quality of the conversation, keeps everyone more engaged and improves collaboration and alignment -- everyone gets clear on what you’re agreeing on. Building on the first session skills, Brandy shares her favorite spatial listening cues and we put them into practice with each other in real time. Visuals create magic in groups. Now we take a look at the questions: What is the role of graphic facilitator? How do you design events that integrate drawing? How do you get your participants drawing as well? Through the medium of an imaginary client meeting your hosts demonstrate how to integrate visual facilitation. We talk about the practicalities, opportunities and pitfalls of using visual tools with groups. In this final session, we focus on how you can continue to grow your visual thinking and visual facilitation skills. And when you are excited about these methods and tools, others will be too. So how do we create a visually savvy culture within our teams and organizations? How do we help transfer our skills and build others’ confidence and capabilities in visual tools? Brandy uses her 20 years experience in the field to answer your questions and give you inspiration for the journey ahead. 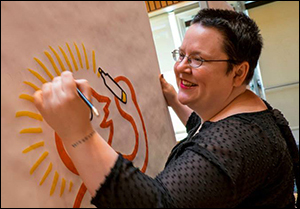 Your guide is visual veteran Brandy Agerbeck, with her lifetime of drawing enthusiasm and twenty-year graphic facilitation career. You -- and your drawing practice -- couldn’t be in better hands! Four two-hour, interactive online session comprise the core of the course. While there will be archive recording of the session, the richest experience is live with us in-session. Session archives, pre-work, additional resources and comment areas are accessible in a member's only area you have access to upon registration. Group Rate: A 25% discount available for groups of 3 or more. Please contact Amy Lenzo at amy@wedialogue.com for the group rate discount code. Brandy Agerbeck writes, speaks and teaches on the power of drawing as your best thinking tool. 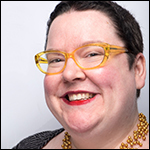 Her first book, The Graphic Facilitator’s Guide, reflects her twenty-year career mapping out her clients’ complex conversations in live, large-scale drawings. Brandy followed this much-loved volume with a book for every visual thinker, The Idea Shapers, the core of her interactive keynote sessions. Mary Alice Arthur is a Story Activist. She specialises in using story in service of positive systemic shift and to access and create collective intelligence on critical issues. She brings a love of powerful questions and the craft of creating compelling conversations to her gift of working with stories. 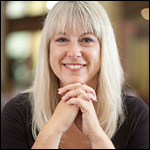 Amy Lenzo has been actively engaged in the field of online communications for over 20 years. During that time she has been blessed to work with some of the most influential writers, thinkers, and social entrepreneurs of our time. It has been an honor helping them share their messages online. Click on the image to open the checklist and print it for yourself. Drawing as a Verb from Amy Lenzo on Vimeo. Drawing as a Verb - The Drawing Switch from Amy Lenzo on Vimeo. 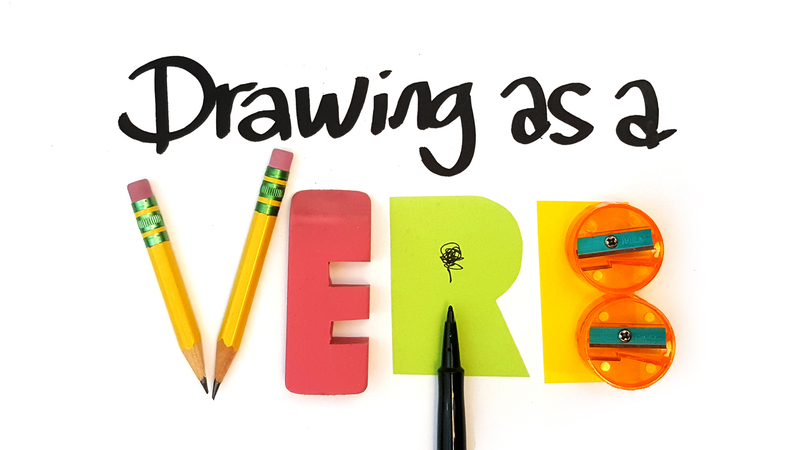 Drawing as a Verb - Every Mark Has Meaning from Amy Lenzo on Vimeo. Drawing as a Verb - From Viewer to Maker from Amy Lenzo on Vimeo.